Use a shoe horn to put on your shoes and to preserve the heel areas. Store your shoes with wooden/ foam shoe trees, in order to restore them to their original shape. Waterproof shoes made from delicate materials or leathers before wearing them for the first time. Repeat this process from time to time, taking care to remove any dust beforehand. Use products that are specifically for the material in question. 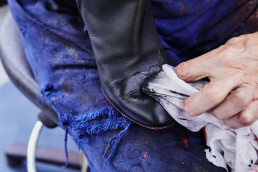 Regularly check the wear to your soles and heel tips.